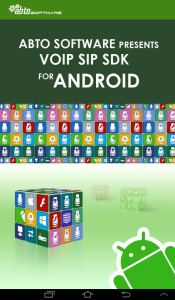 A new video by ABTO Software is about its updated VoIP SIP SDK for Android. You can read more updates in the second version of our SDK here. The clip provides a basic guide on how to install, configure and use the SIP softphone for Android from Google Play to make a test call that has 1 minute limitation. To make your own softphone please contact us to download and purchase full version of the SDK.